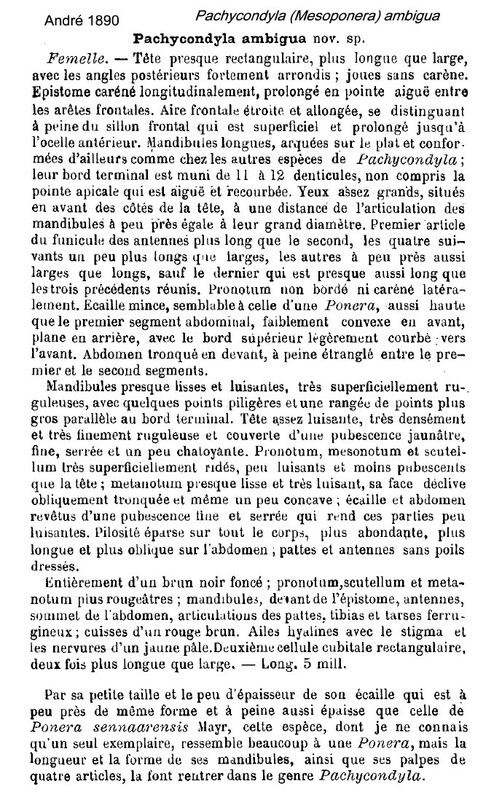 André's (1890) description is at . Note - there does not seem to be any definitive description of the worker but the examples below seem to have several features in common with the queen; i.e. apical segment of funiculus relatively long (as long as three preceding together), long mandible with 12 denticles apart from apical tooth; André, however, gives the length of the queen as 5 mm. 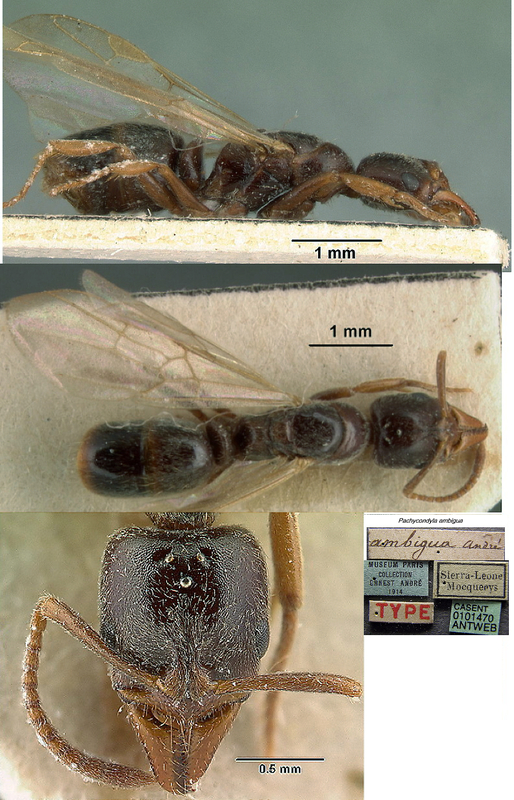 The photomontage of the holotype, collated from http://www.antweb.org/specimen.do?name=casent0101470, confirms the size as correct. Nigeria specimens (as Mesoponera ambigua, Taylor, 1976: 25). WORKER. TL 4.02 mm, HL 1.18, HW 0.96, SL 0.87, PW 0.75 (in my guide as Mesoponera ambigua). Colour very dark red-brown, lighter brown on extremities, shiny. Dense pilosity except on propodeum. Mandibles large and elongate triangular, with more than eight teeth. Clypeus longitudinally carinate. Metanotal groove present and impressed. Propodeum compressed above, considerably narrower in dorsal view than the pronotum, posterior face concave. Petiole a thick scale, subpetiolar process with an acute posterior angle. Collected nesting in a dried cocoa pod on the ground, and active on the ground and lower part of a cocoa tree. Nests also in leaf litter and other dead wood on the ground. These seem to match the general form and shape of the type queen. The photomontage is of a worker from Cameroun; Awae II; collector A Fotso Kuate (fk pachycondyla sp3). 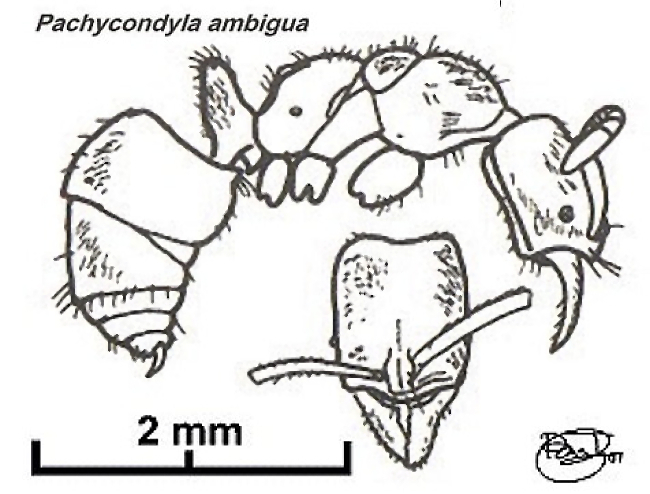 Bolton (1995) there seems to be confusion with the "unresolved synonym" Ponera ambigua, worker described from Sudan (Weber, 1942a). In his key to Ponera (now all Hypoponera), Bernard (1952) has TL 2.5 mm, colour yellow-brown; scape extending beyond the posterior border of the head; eyes minimal and situated towards the middle of the cheeks. Bernard had examined the material collected by André and was obvious to me from the original description that Weber described a genuinely separate species - that thought now (June 2014) has been confirmed, see Fisheropone ambigua [former Hypoponera ambigua]. Collingwood (1985), reported it from Saudi Arabia, noting that the eyes are small but visible. In Ghana, Belshaw & Bolton (1994b) found 24 specimens in leaf litter at five sites - under cocoa at Ofinso (2.xi.1992), and from primary forest at Sui River Forest Reserve (1.x.1992), Mankrang Forest Reserve (11.iii.1992), Kade (12.x.1992) and Atewa Forest Reserve (primary forest near Kibi, 2.iii.1992, and Potrase, 24.iii.1992; logged forest near Sagymasi, 27.iii.1992).